Following Andy Tauer’s Rose Master Class at Les Senteurs on Thursday I have had roses on the brain. Well, to be precise I have had Andy Tauer’s rose fragrances on my brain, so this week, it makes sense for me to write about two Tauer fragrances that I have been meaning to review for quite some time – Une Rose Vermeille and Une Rose Chyprée. Seeing as I am renowned for having quite a sweet tooth and being a sucker for anything rose flavoured, I will start with Une Rose Vermeille. 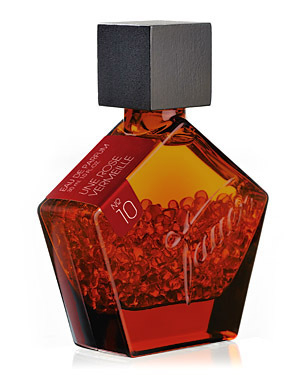 Une Rose Vermeille was released in 2010 and is the second addition to Andy Tauer’s ‘Homages’ line, which also houses Une Rose Chyprée and Carillon Pour un Ange. It is described as a ‘Gourmand Rose’ and is, in my opinion, the most delicious fragrance I have ever tried – it is a rose good enough to eat. Une Rose Vermeille’s opening is a stark contrast to what comes later, the fragrance opens with the familiar citrus notes of lemon and bergamot, and it is at this point that I usually employ my favourite adjectives for citrus which include; ‘sparkling’, ‘bright’, ‘fresh’, ‘mouthwatering’ and ‘zesty’ and it’s fair to say that all apply here. The citrus is joined by the sweet, herbal quality of lavender and whilst being somewhat short-lived, the lavender feels like a well thought out addition that counteracts the zesty nature of the citrus and adds a caramel-like sweetness. Rose is at its best when it is used as a flavouring, I personally love most things that are rose flavoured, including; rose tea, rose turkish delight and rose macarons, the latter of which is perfectly represented in Une Rose Vermeille. 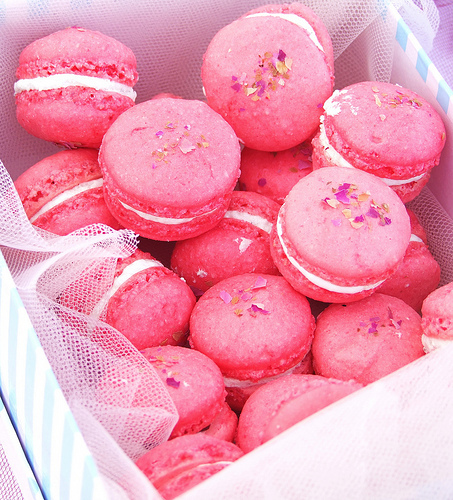 This olfactory macaron is a heavenly blend of the brightest, and most edible red roses and sweet, sparkling violets. The addition of raspberry adds a tart, juicy nuance and just when you think things simply cannot get more delicious the whole composition is filled with vanilla and tonka which pushes Une Rose Vermeille into mouthwatering territory. The vanilla is the creamiest, most gourmand vanilla, which thanks to the tonka, is delicious without being cloying or jarring. There is a touch of ambergris in the base but it is less prominent than in other Tauer fragrances, which in this case is probably for the best. There is also some sandalwood present and It is used cleverly, only the creamy side of the sandalwood is allowed to come through rather than the drier, woodier element. In the final stages of its development, Une Rose Vermeille settles on a beautiful, full vanilla with touches of raspberry and rose. It is one of my favourite dry downs and like the beautiful confectionary that is represents, I simply cannot get enough. Une Rose Vermeille also has excellent longevity and silage, in fact it is best applied with a light touch, which may sound like strange advice coming from me (I do like my ‘fumes loud after all) but when over-applied, Une Rose Vermeille becomes a ‘Godzilla Gourmand’ and the delicate nature of the macaron is lost. If you like roses, gourmands or both then I IMPLORE you to seek out a sample of Une Rose Vermeille, it is one of the best examples of a floral gourmand available and wipes the floor with others in the genre, which seem like impostors in comparison. Une Rose Vermeille, and the other fragrances within the ‘Homages’ line are housed in Tauer’s signature pentagonal flacon, however rather than the usual cobalt blue, the glass is a rich, burned amber in colour. A cube lid made of wood adds a nice finishing touch. Une Rose Vermeille is available in 30ml Eau de Parfum for £99. This review is based on a sample of Une Rose Vermeille from my own, personal collection. Posted in Feminine, Floral, Gourmand, Perfume Reviews, Tauer Perfumes and tagged Floral, Gourmand, Rose, Tauer, Une Rose Vermeille. Bookmark the permalink. Great review for one of my favorite roses. I see a full bottle of it in my future. And now I want a macaron. It is a very beautiful rose. Do you think it’d be difficult to get the last few drops of juice out given the nature of the beads? Or are they packed so tightly that they just act as a solid surface? I’m not entirely sure. The beads are very fluid within the bottle and move around very easily. When I first wore this perfume, it was too sweet and fruity, but the weather is cooler now, and your review makes me want to try it again! Let me know your thoughts when you re-test it, it really is delicious! I’m so glad you did a review of Une Rose Vermeille. I love this Tauer so much. I think Lonestar Memories may be my first full-bottle purchase from Andy, but this will most likely be the second. It really is one of the best gourmands out there. It is probably my favourite Tauer, along with L’Air du Desert Marocain and Pentachord White. I’m with DeeHowe on this one, so I’m off to re-test my sample! I was on the fence with this one when I wrote my review. I love it but I was like “do I need a FB?” I thought I’d decide once the sample is gone. I feel like your review pushed me, in a good way, to just buy this. I really do love it. It’s frivolous and fun. But, somehow serious. I call it the “Cindy Sherman” of the perfume world. I agree there is a vivacity and sense of fun glamour about Une Rose Vermeille that makes it irresistible. Raspberry is an odd note, it can definitely make or break a fragrance. At least you have the Une Rose Chyprée for consolation, I’m sure that it will make you feel miles better! Well, I’ve spent the day with URV and thoroughly enjoyed it! It wears much better on me when the temps are colder. I don’t see cedar listed in the list of notes or mentioned in your review, but about a 1/2 hr into the test I smelled it like a ghost hovering over my shoulder, then just as I would turn my head to look it would disappear. That phantom cedar was great fun! Has anyone else out there had that experience? Wow, I love the sound of the ‘phantom cedar’, I’ll have to test it again to see if I can detect it! I’m glad you like URV more this time round, it does work better in colder weather, I think that it may be too gourmand for summer. Anyway, this was one of the samples I tried. Beautiful, rosy, fruity, sweet, just basically AMAZING! It’s obviously pricey for a mere 30ml…if I decide to buy it, it would be one to wear on occasion only – but then it’s one of those that you would be devastated if it wasn’t picked up on. Me too! It’s beautiful there isn’t it! Wonderful sums it up perfectly for me. This review pushed me over the edge and I ordered Andy Tauer’s discovery set, including Une Rose Vermeille, of course! The verdict is, like Undina, I see a full bottle of this happy, yummy, pretty scent in my future. I knew I loved roses, but this sweet twist has opened up a new experience. Thank you, dear enabler 🙂 Draining my sample enthusiastically as we speak! Oooh I’m so glad that you have discovered this one and are now lusting after it. To me it’s the most glorious, edible rose fragrance.